This post is reprinted from the Phoenix Landing Fall Newsletter. I try to incorporate food items into toys to make them more interesting and it seems to me that I get more sustained activity if there is a bit of food hidden amongst the items strung on a toy. I have found that a rice cake will have great shredding appeal when added to toys. My favorite application is to top an empty clear plastic applesauce cup that has nuts, small pieces of vegetable and fruit inside with a rice cake. My parrots will eagerly shred through the rice cake to get at what is inside the applesauce cup. I find my birds are more interested in shredding away the rice cake to get at what is under it than they are in eating the rice cake. But it is good to know that there are whole grain rice cakes available that are made with brown rice and no added salts or sugars. Recently, in a quest to give my parrots something new and exciting to do; I found that ice cream cones make great additions to toys. They have the same appeal as the rice cakes and they add variety. I will make a small hole in the end of the ice cream cone or cup and string it on the toy (upside down). Inside the ice cream cone I will put nuts and other treats and then cover the cone with an empty applesauce cup. Above and below those items are other toys like a crunch ball, whiffle ball, corn husks, plastic toy parts, etc. 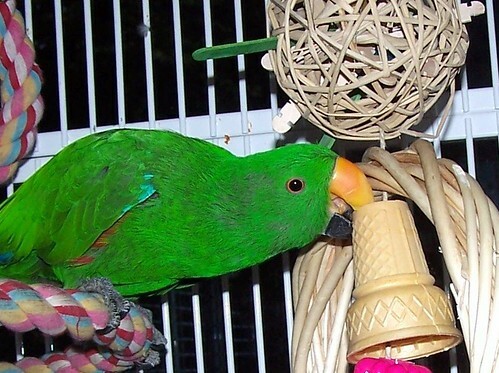 I hope you have found these ideas helpful and that this article gives you inspiration to tweak your imagination and think of other ways to incorporate the rice cakes and ice cream cones into toys you make for your own birds. Kris Porter is the author of the Parrot Enrichment Activity books and Parrot Enrichment.com. 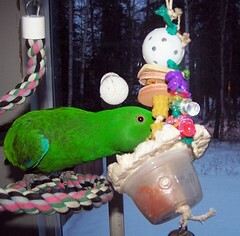 This entry was posted in Parrot Enrichment and tagged foraging. Bookmark the permalink. Excellent post! My guys are going to love the rice cakes. I’m so glad for the suggestion! I tried a rice cake out with my Timneh African Grey. It was a big hit. Thanks for the idea. Going to definately try this! Thanks for sharing! Love the rice cake idea. I have 6 rescued budgies. They love nibbling on/playing with and throwing popcorn, the plain kind, home popped corn kernals.